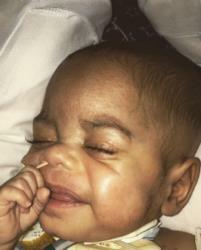 Master Killian Michael Evans, died on April 21, 2018 at Norton Children's Hospital in Louisville, KY.
Master Evans was born on September 23, 2017 in Louisville, KY to Michael Bonds and Jah-Nay Evans. He was preceded in death maternal great grandmother, Phyllis Ann Evans and Lahoma Dean Mather, maternal great grandfather, Donald Mather, maternal great great grandfather, Solomon Evans, Sr; and two sisters, Ma'Leigha Evans and Marley Evans. Funeral service will be held at 12:00 noon on Saturday, April 28, 2018 at Percell & Sons Funeral Home with Rev. John H. James, officiating. Burial will follow in Elizabethtown City Cemetery. Visitation will be from 4:00 to 8:00 pm on Friday, April 27, 2018 at Percell & Sons Funeral Home. I’m tremendously sorry for your loss. May you find comfort knowing that he is with God now. I love you sis. Our hearts break for you. Praying God comforts and carries you during this difficult time, and praying He fills your heart with the peace only He can give. God bless you and so sorry for your loss. We love you and are praying for God to bring you comfort and peace.